Miss Four is the best mare owned by Black and Blue Quarter Horses, although, we now own two full sisters of hers as well. This mare was purchased in 1999 from Haythorn Land and Cattle Co. at the first BEST OF THE REMUDAS sale. She has produced one horse colt for us out of Leo Hancock Hayes. Since she produced " Leo ", she has had a red roan filly and two horse colts out of GB Cee Booger Red CL . 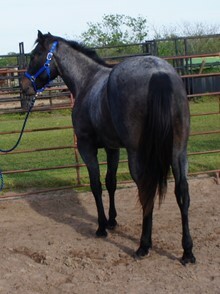 One of the horse colts is a beautiful Blue roan quarter horse named Four Blue Cannons CL . He can be seen on our "Stallions " page here on this website . SHE IS NOT FOR SALE AT ANY PRICE! Miss Four is broke to ride and is very quick on her feet . She is one extremely good blue roan quarter horse brood mare however, she could have made an outstanding roping horse or an all around cow horse . Our intense summer sun keeps her from looking roan in this picture, but she definitely is a roan horse . This is another mare we have in foal to A Streak Of Fame for a 2016 baby.